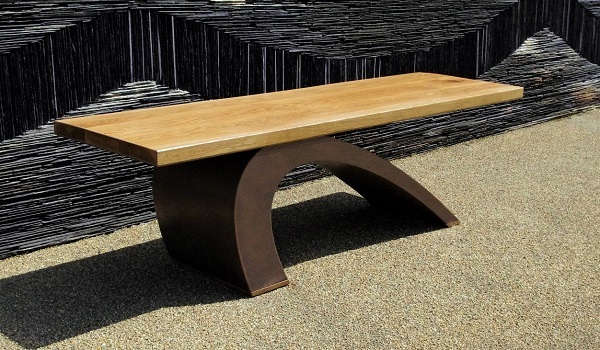 Modern garden bench; Take a seat on something that’s more than just a bench! Surf is suitable for the home and as contemporary garden seating. The bench base has a wave design steel box-section construction. Available in a choice of mirror polished stainless steel, grained stainless steel or metal finished in bronze, brass, verdigris or copper. Bench top and feet are solid wood. Choose from teak, sapele, oak or walnut. Alternative woods choice available on request. Comes waxed or fine lacquer finished. Product care – Dust base regularly and only if necessary, wipe clean with a damp cloth, buff after with a dry cloth. Re-oil when necessary. Avoid placing sharp objects on wooden top to prevent scratches. Furniture Delivery – Free delivery within the Uckfield delivery area (up to 40 mile radius). Outside of that from £50. The Surf is our signature piece. 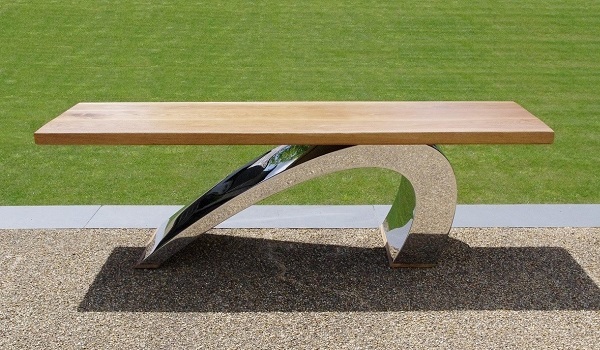 This luxury modern garden bench with statement appeal is a real show stopper. 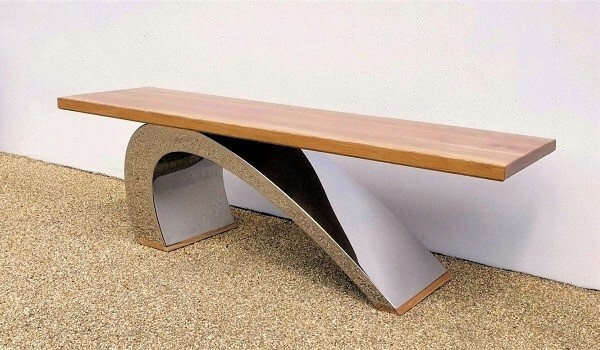 Surf makes an incredibly robust modern luxury garden bench that also doubles as a beautifully stylish coffee table. 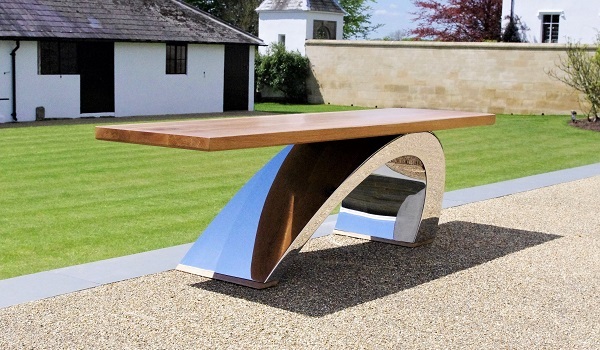 Position this bench/table on a modern patio or terrace, within a contemporary out-door eating area or by the poolside. In addition Surf is perfect indoors, within a conservatory/orangery, summer house or garden room – use with garden loungers. If you want to create a talking point then this piece will deliver. Giving the appearance of defying gravity the ultra-modern Surf gives a nod to the principal of cantilever. The sweeping curve of the sculptural base reflects breaking sea waves and the solid wood top a surfer’s board. Available in mirror polished stainless steel to provide a cool contemporary look. Or choose a copper or bronze finish for a warm and luxurious feel. Our metal finishes can be left to naturally age over time, so are perfect for a more traditional heritage look.